Need more information about booking Home 7258272 ? Our condo is in Kingston Plantation- a wonderful 145-acre master planned oceanfront resort community. Fresh water lakes, rolling wooded terrain, beautiful dunes, and a half mile of secluded beach make the property naturally appealing. Our lodge spotlights one of the most impressive settings in Kingston. It's tucked around the curve of the Plantation's largest fresh water lake, affording you with breathtaking views of both the lake and ocean. The landscaping is natural but meticulous. The condo has been professionally decorated and invites 6 people to stay comfortably- 2 people in the 1st bedroom (two twin beds), 2 people on the pullout couch, and 2 people in the Master Bedroom (king size bed). Guests will have access to the pool at Laurel Court and, of course, the beach. Guests also have the option of purchasing a daily or week pass to the 50,000-square-foot, multi-million-dollar Sport and Health Club Complex which boasts the following: an indoor heated swimming pool, a sauna, Jacuzzi, cardio equipment, free weights and weight machines, as well as aerobic, yoga, and Pilates classes. 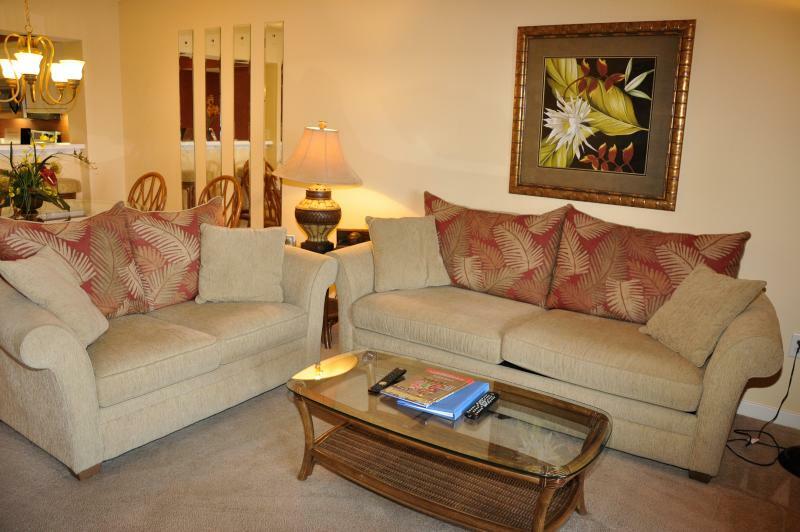 For an additional charge, guests have access to the tennis and racquetball courts. Massages are also available. Golfing discounts are also available to the Arcadian Shores Golf Club located directly across the street from Kingston Plantation. You can get in touch with Soraya (the owner) through the contact form on this page. Send Soraya (the owner) an email through the contact form on this page. Alternatively, if there’s a phone number on this page, you can call them. How do I contact Soraya (the owner)? If you’ve already booked, go to Manage your holiday booking to view Soraya the owner's contact details or send them a message. Or send Soraya (the owner) an enquiry through the Contact the owner/manager form if you’d like a quote or more info first. When you pay online through the Book your stay form, a booking request is sent to Soraya (the owner). You’ll find out within 24 hours whether they’ve accepted - no money will leave your account before then. You can also request a quote from Soraya (the owner) through the contact form. The owner will email you the total cost for your dates and a link to book and pay online. Use the Book your stay form to pay provisionally online. You can pay by credit/debit card or PayPal. Soraya (the owner) will have 24 hours to accept the booking and no money will leave your account before then. Why can't I call Soraya (the owner) before booking? You’ll need to contact Soraya (the owner) to do this. Send them a message in Manage your holiday booking or through the contact form on this page. You can request to change the dates or number of people on your booking via the Manage your holiday booking page. To change your holiday dates use the Edit booking button. If you need to change the number of guests staying then send Soraya (the owner) a message. If Soraya (the owner) agrees, they’ll send you a revised quote outlining the changes. You can review and accept/decline this from the Manage your holiday booking page. You’ll have 48 hours to take action before the revised quote expires. Estimated price per night based on a weekly stay. Owner fees of £93.00 per stay may apply. Enter your dates to see the total cost.